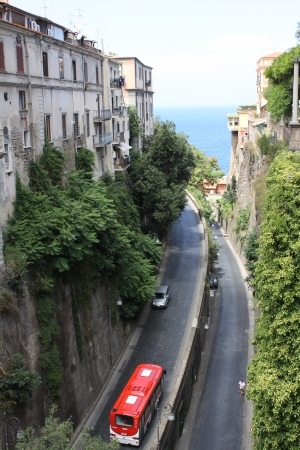 A short train ride from Naples will give you a complete change of scenery. The contrast from the big, dirty city of Naples to the beautiful clean, interesting and enjoyable city of Sorrento is amazing. 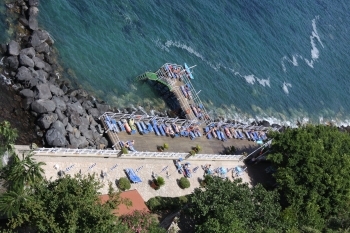 With buildings built high on the top of the cliff 50 meters from the sea and overlooking the scenic Gulf region, Sorrento is a breath of fresh air and a place to relax and enjoy. 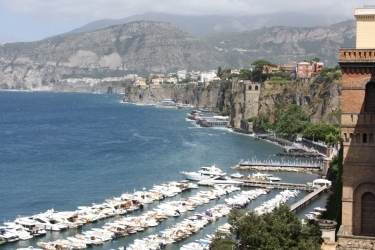 Because of the location, Sorrento has a mild climate and although it gets hot in summer it is cooled by the ocean breeze. The tiny colourful streets, sidewalk cafe’s and impressive views over the ocean makes this a very popular tourist destination. Five Star Exclusive accommodation take the most prominent position on top of the Cliffs, often gated and highly secure to protect the rich and famous that come to stay there. If you are thinking of spending the day at the beach in summer be prepared to pay at least 12 euros. The beach is privately owned and a charge covers entrance plus a deck chair (or lounge chair which is more expensive) You can purchase a beach locker for the day also. There is so little sand that people put deck chairs along the jetty or anywhere else they can find a spot. For more than 50 years, Hotel Poseidon has offered, thanks to the Aonzo family daily commitment, a discreet and elegant hospitality and the personnel politeness help to create a warm and familiar atmosphere allowing their guests to feel at home. Hotel Poseidon’s restaurant, “Il Tridente”, which allows guests to dive into the local area’s rich culinary tradition, is located on the terrace area with splendid pergolas and a breathtaking view of Positano and the bay. The Hotel Poseidon has a Beauty Centre, the first one in Positano, created to offer its guests and non-staying guests, a wide range of face and body beauty treatments, and massages: a steam room dug into the rock and a panoramic gym are there too. The spacious terrace with a pool overlooking the bay is the perfect place to relax. A nip and tuck has transformed this former 17th-century monastery on Italy's scenic Amalfi coast into a luxurious 20-room boutique hotel, which opened in May. Relax in the heated infinity pool and gaze at views of the coastline. The spa is a temple of luxury that combines monastic architecture, including original 17th-century vaulted ceilings, with modern facilities such as an indoor hydrotherapy pool, mosaic heated benches and whirlpool foot baths. Rooms from $478 a night. Positano is one and a half hours drive south of Naples along the Amalphi coast. My favorite place in Europe! It's a must to see. Don't stay in Naples it's dirty, nothing much to do and heaps of pick pockets. You would be best to hire a private car and drive to Positano The one and a half hours is the most amazing scenic views along the Amalphi coast on your way to Positano. You should also stop in at the famous church which is in the main part of the city. There are also half day trips by boat along the Amaphi coast where you can see the beautiful blue grotto! It is amazing....We stayed at Bucaramanga Di barco hotel if u plan on staying. Send us your story, review or story about a holiday destination or experience in Amalfi Coast or Italy.